Gipsys (Romani-people) as a communities all around mostly Europe has always raised interest during the last few centuries however little is known on their stereotype of living. Gipsys are famous for their illiteracy, for their cheerful temper, wild character and nomadic life-style as well as strong closed community. Gipsys are famous for that they don't have their own writting (even though they have a number of gipsy languages) and because of them Romani, doesn't keep any record of their history and any history or lifestyle of them is only to be found by non-gipsies. Gipsies are famous for being able to steal for their inclination to telling fantastic stories, be involved with fortune-telling, exaggerating facts or telling lies about their private life, they're famous as good virtuosos musicians and good artists. Most of Gipsys are Christian, Muslim or Atheists. The high-level of illiteracy they have makes anyone educated among them to be considered a success in life. The interesting way of living of Gipsys has triggered many people to create movies, trying to picture Gipsys life-style like Emil Kosturica's Time of the Gipsys. Yesteday I was invited by Andrea (an ipo-diakonus) in Saint George Dyrvenica Church in the Polish Culture center here in Sofia to see another movie dedicated to Papusza (Bronisława Wajs) – (1908-1987), a famous gipsy who is practically the first (Polish Gipsy Romani) classic poet and singer. The word Papusza in Gipsy language means 'A Doll' – a name given to the future poetess by her mother. The movie is a great to saw for anyone willing to know more about the history and culture of gipsys in a synthesized form. My interest into Gipsys is because in Bulgaria officially we have about 350 000 Gipsys and I've encounted many gipsys in my life. During my studies in Netherlands, I had the chance to spend quite a lot of time, being in close relations with Bulgarian gipsy family and I was fascinated on how good hearted and primitive truthfulness of gipsys. Now back to the movie The fact that a gipsy woman could write a beatiful inspired poems and sing so beatiful and most importantly read was almost scandalous! for the post age of World War II and 1960-80s. Papusza movie is mostly interesting to anyone interested in culturology and antropology as it depicts the Gipsys common lifestyle and for those who already encountered gipsys in their life gives another understanding on why gipsys are who they're and why they choose to live the nomad, poor, uneducated, often careless but joyful and passionable life. 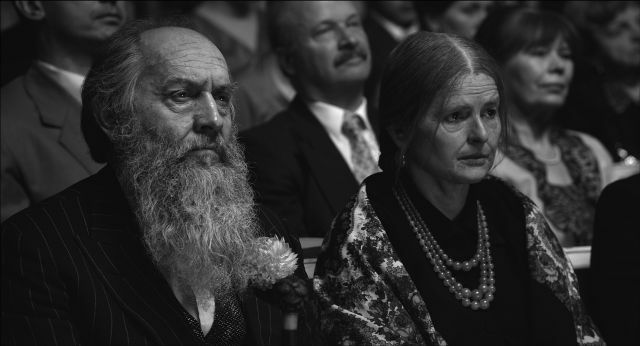 The movie start showing Papusza's mother while still pregnant with the future poetes. 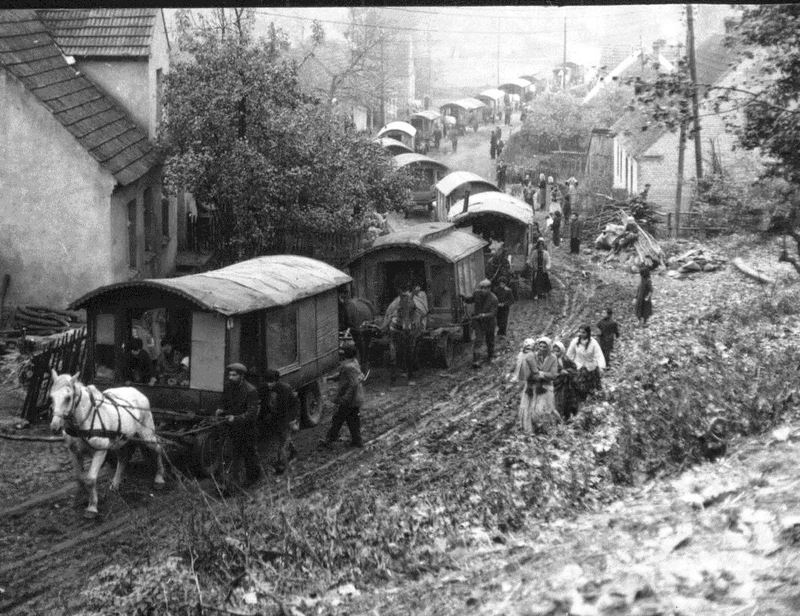 In the 1900s when the story goes Roma (Rom meaning man), just like jewish were quite a closed community moving all through the country of Poland or any other country residing using a horse-drawn caravans (tabors) as a moving houses. Consorting with non-romas (Gadjo's – meaning like the Jewish Goa distinguishment for non jewish) for any reason different than trade was considered unclean. However the young poetes had the non-gipsy Wajs surname because according to legend her family used to be touring the great courts of Europe with their harps entertaining kings and aristocrats. From her birth Papusza was known to be different. A spirit predicted that she would either bring great honor or dishonor to gipsys. where almost none gipsy was literate. She is presented stealing a chicken and preseting it to a Jewish store-keeper lady in return for lessons in learning. is shown to have brought supposedly "a curse" on her people. 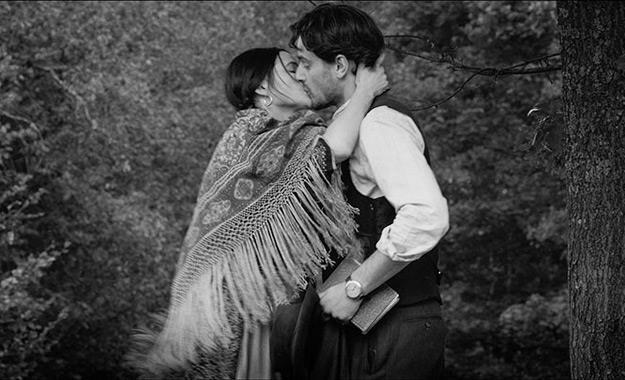 Papusza meets the Polish poet Jerzy Ficowski in 1949 at a time after being forcefully married to her step-uncle Dionizy Wajs for more than 25 years. The Gadjo (Ficowski) travels with Wajs caravan for about 2 years as he aims to learn the Romani (Gipsy) language and the gipsy was of life. He is struck by the beatifulness of Papusza's songs and liking them encourages to continue writting poems. Later Ficowski returns to Warsaw in 1951 and translates from Gipsy Papusza's verses which broughts Gipsy to a mindset that Papusza reveals their secrets. Later the scandal progresses as Ficowski publishes a monograph book "Polish Gypsies" – a book about the beliefs and moral code of the Roma Gipsy people. Being grieved Papusza's clan takes decision to cast her out. The movie is amazingly giving "a feel" on the fascinating and simple Gipsy nomad lifestyle during the first and second World War in which they were chased marked and killed by Hitler's Germany just like the Jews. The bitter experience later led to Papusza's creating one of her most famous songs. The movie is quite intersting from jumping from time to different stages of Papusza's life not in a specific order but often showing facts backwards etc. After the end of the war in Poland Communist authorities enforce laws to make Gipsys settle, tryting to ensure them work and job and try to "program" and make part of communist society gipsy kids by using Kindergarden. Romani's a are shown to have problems with authorities and their desperate discontent to go against the country program for settlement of Gipsys, they cannot any more hire the randomly old houses to survive the winter and while unable to survive the harsh Polish winter, they finally settle in attempt to become part of society. However in the newly built communistic society, they fail to fit well as always considered a second class people, they mourn for their old nomadic vagrant way of people and they fail to integrate to society (pretty much like today). 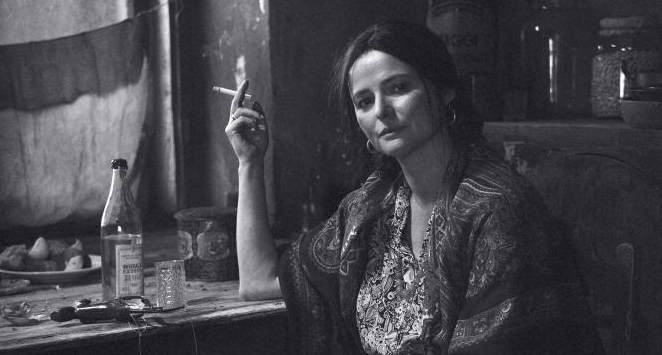 Papusza's spent rest of her life in misery being rejected by both her native Gipsy community for betraying some of gipsys secrets and same time unaccepted by Polish people that continue to consider gipsys inferior. 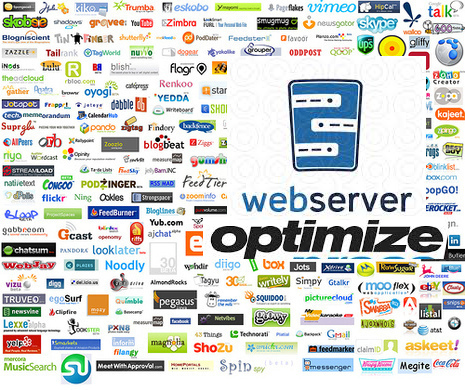 There are plenty of ways to track graphically server performance in Web (Nagios, Munin, Zabbix, OpenNMS) etc. 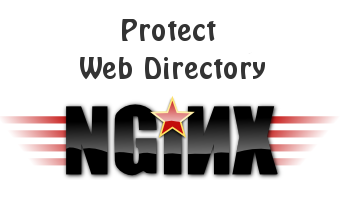 Though Munin and Nagios is a great choice for people who prefer simplicity in installation and maintanenance. If you're looking for customizable reports and time windows history on how server (network, cpu, memory, hdd or services) behaved you will probably need to consider using Cacti. 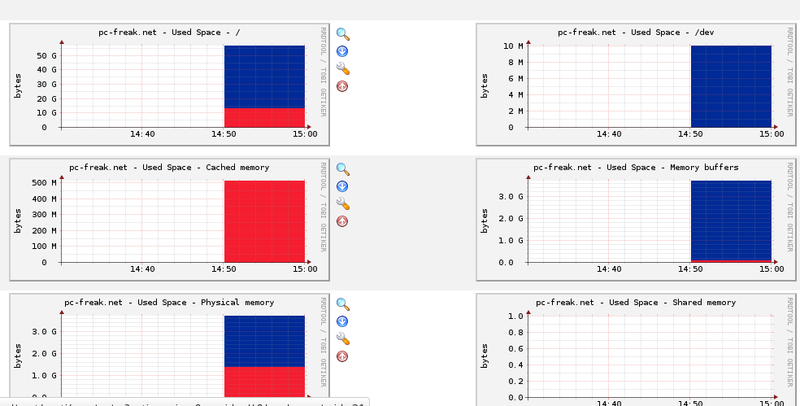 Cacti is very much like Munin except Cacti gives you the possibility to select and show statistics for periods in time, making it very convenient to check how server/servers services performed historically in time. 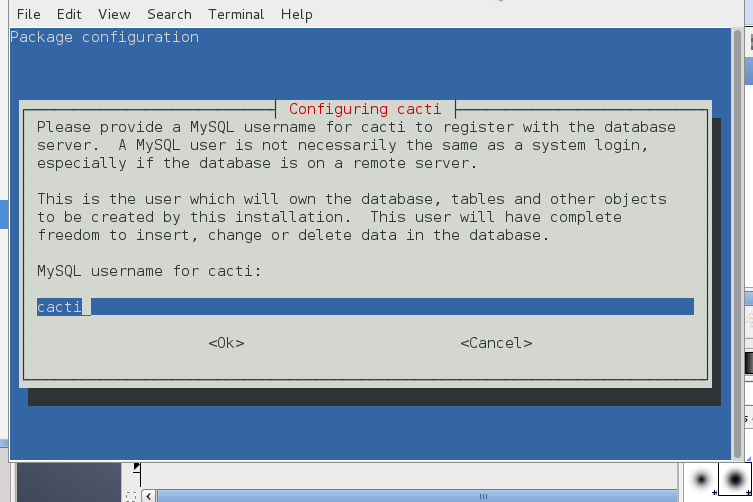 Cacti is a bunch of PHP scripts that gives a nice frontend to the famous RRDTool, it stores all gathered service statistics information in a MySQL database. Web frontend queries the SQL to craete graphs and populate them with data . Cacti has SNMP protocol support for those used to creating traffic graphs with MRTG. Its easily extendable, there is a "tree view", which allows you to put graphs onto a hierarchical tree for organizational purposes, there is a user based management tool built in so you can add users and give them rights to certain areas of cacti. You can create users that can change graph parameters, while others can only view graphs. Each user also maintains their own settings when it comes to viewing graphs. 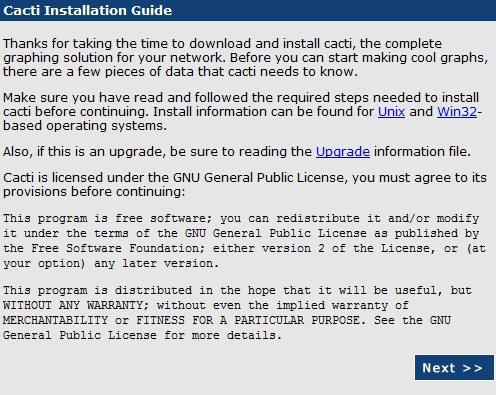 Cacti has prebuilt packages for major Linux distributions as well as FreeBSD ports. You will be next prompted to fill in user and password for cacti user, type whatever you like it to be and save the password somewhere for later use. You will have to also create manually following files which will be used by cactito store rrd data. Note! 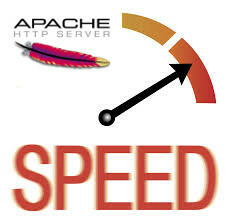 that if you already have a server with Apache + PHP configured many of above packages will report to be installed. After logging, Click Graphs tab (located on left top) corner and after a while your should see the graphs start to be drawn. So far so good now Cacti is installed but to make it generate its configuration its necessery to do some configuration tampering. 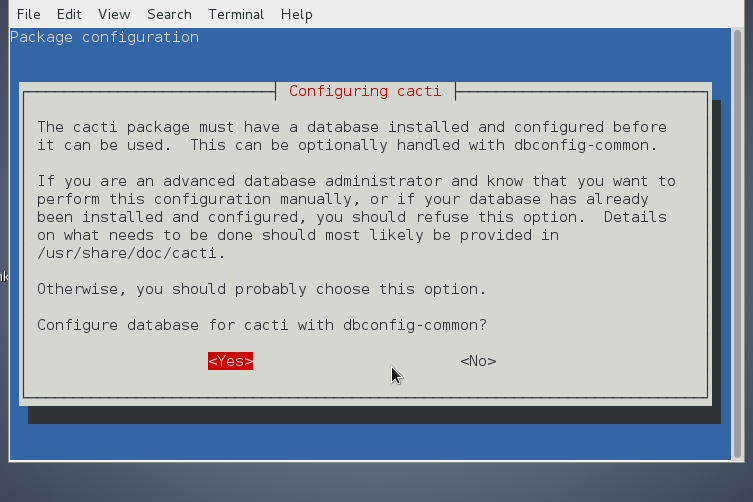 Cacti's configuration is pretty obscure and it needs time and a couple of tries until you have learned how to configure statistics generation. Cacti's web interface is divided by two major parts Console (From which all kind of configuration is done) and Graphs (From here all confugured graphs can be expected, and information for time periods setted services, memory, CPU, hard drive, etc. can be obtained). 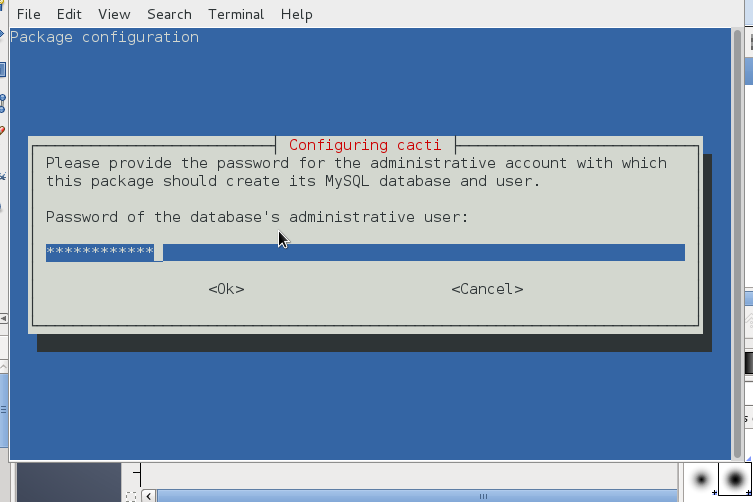 By default Cacti is configured to have user admin with password admin. Login to Cacti and you will be prompted to change default password – set it to whatever you like. 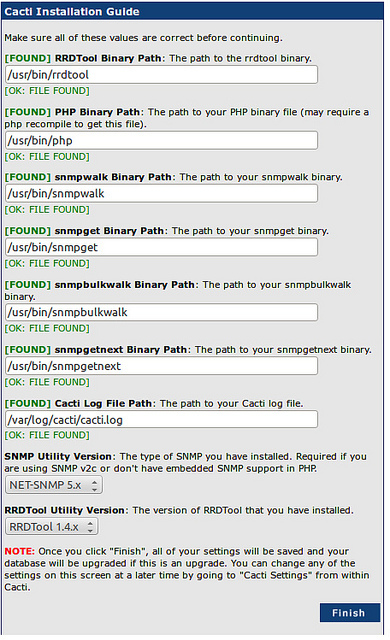 Cacti will use SNMP protocol to obtain server traffic statistics and visualize them. Here I've used localhost (127.0.0.1) as a hostname, because localhost server is to be monitored for remote monitoring of cacti set the REMOTE IP or hostname instead. P.S. 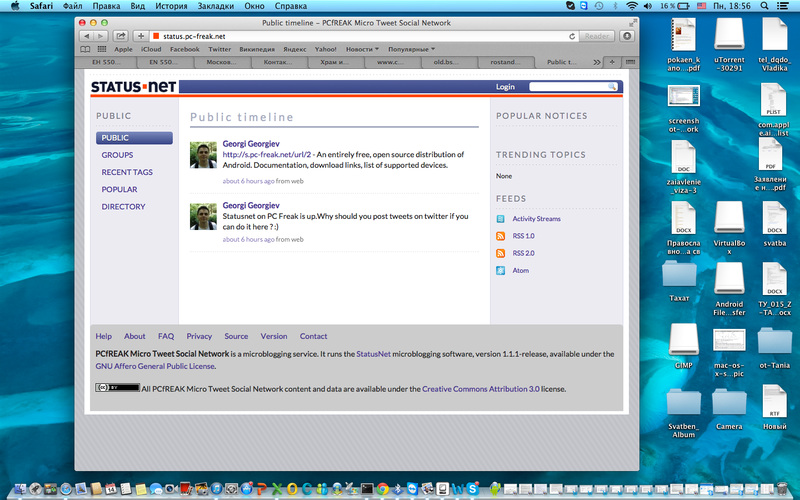 Use the Add button for all this ..
Click on Create Graphs for this Host see – top right side. 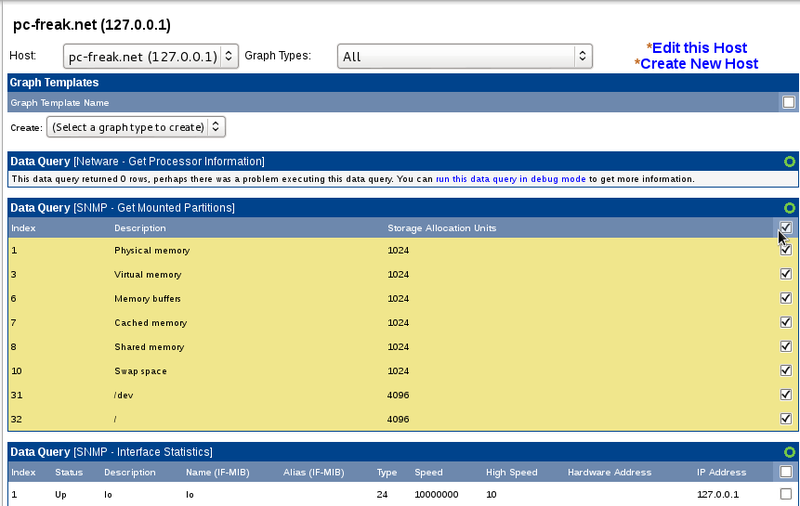 By default, Cacti uses 32-bit counters in SNMP queries. 32-bit counters are sufficient for most bandwidth graphs, but they do not work correctly for graphs greater than 100 Mbps. 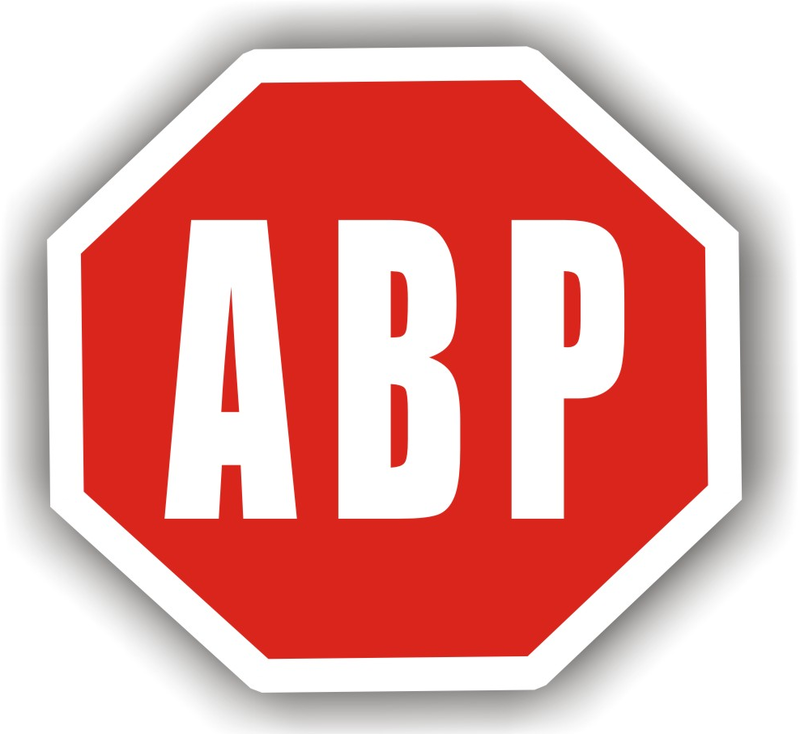 If it is known that the bandwidth will exceed more than 100 Mbps, it is always advisable to use 64-bit counters. Using 64-bit counters is not hard at all. Important thing to mention is Cacti is requiring php exec() option to be functional. On hosts which has disabled exec(); function for security reasons cacti will fail to produce graphs.